Pretty late for this but better late than never 😆 Plus I haven’t missed out on making a monthly overview post since I made this blog so I’m not planning on changing that now haha. My plans for this month is to hopefully get a review out for Jakou no Lyla Vol.1 (though at the time I’m writing this I haven’t finished one route yet) and hopefully write a review for prologue and episode 1 of Toraware no Palm Refrain–it’s long due for a review lol. I still haven’t fully upgraded/updated my blog pages and stuff, hopefully I can get around to doing it along with trying to mess around and make custom “smilies”/emoticons or whatever, hopefully I can make some icons to show what platform a game is (e.g. icons for switch, ps vita, pc, etc) and just insert it into text like an emoticon. Anyway, not much to release this month but here’s a synopsis of each game anyway (copy and pasted from my recent post overviewing 2019 bc I’m a bit lazy lol). Zettai Kaikyuu Gakuen was once a PC game which then got a port to the PS Vita in 2016. 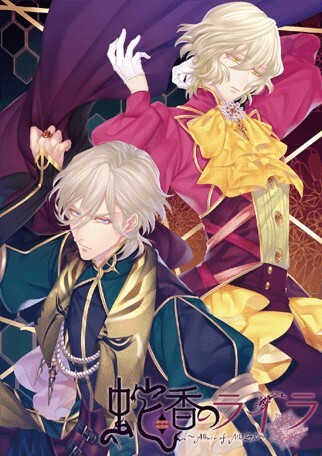 Now in 2019 they are porting it to the PS4… a platform that was abandoned by Otomate months after deciding to port some of their games onto. This may be just a late decision that they cannot afford to back out of. But hey, they crowdfunded a fandisc for PC, with a goal of 1.5 million yen they surpassed their goal and have now raised 8.5 million yen (funding 568%). The PS4 version boasts about adding new CG, better voice and BGM quality and being in Full HD. Jakou no Lyla is the second volume of an ongoing PC series, . The game focuses on the themes of “love triangles” and “espionage”. The game is split up into 3 volumes for maximum profit, the first volume had the subtitle of “European Nights” focusing on two European boyos, while the second volume has the subtitle of “Asian Nights” with two princes/emperors (I have no idea what the term of an offspring of an emperor is lol) of a vague Asian kingdom/country (I’m guessing China). Shirien, the heroine, is hired by one of the romanceable guys to seduce the target of the client to obtain information or manipulate the target’s actions.